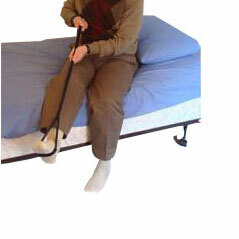 The SafetySure® Leg Up™ is the ideal product for individuals that have trouble lifting their legs in and out of bed. The Leg Up™ can also be used to place your leg on the footplate of any wheelchair. The Leg Up™ is 42" in length and is made from nylon webbing. The center portion has an aluminum insert that keeps the Leg Up™ stable when placing the end loop over the foot. The aluminum insert also provides added leverage when lifting. Great for individuals with limited leg mobility.